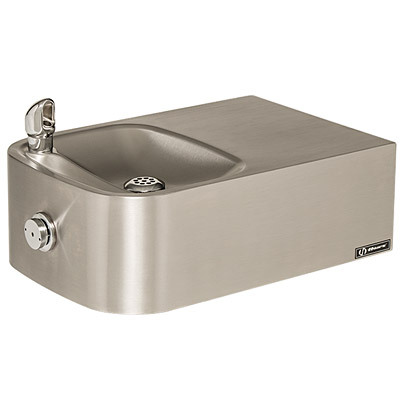 The Haws 1109.14 Drinking Fountain is a wall mounted, barrier-free unit with 14 gauge Type 304 Stainless Steel with satin finish. It includes a push-button valve, polished chrome-plated brass bubbler head and waste strainer, integral 1/4" stainless steel mounting plate, vandal-resistant bottom plate and 1-1/4" NPT trap. Perfect for either public or private indoor/outdoor settings, Model 1109.14 is a great fit in areas where aesthetics are important to the overall appeal of the architecture. Suitable in areas where extra durability is needed, thicker gauged steel is implemented so this unit mounts solidly from any wall. Beautiful satin finish helps to maintain the fountains overall appeal so it always remains looking as new as it did when it was installed. Specifically, this type of wall mounted drinking fountain may be placed in settings such as: schools and other locations in and around office buildings where the temperature remains above freezing. With its patented (Pat.# 6,981,692) push-button valve assembly which allows for front access stream adjustment as well as cartridge and strainer access, this fountain offers the ultimate in ease of maintenance. Fountain is pre-built and fully water and pressure tested to ensure no leaks and proper function for reduced installation time and added peace of mind. Heavy-duty 14 gauge Type 304 Stainless Steal construction with integral mounting plates for extra durability. Unit also includes vandal-resistant bottom plates for added peace-of-mind. Patented (Pat.# 7,025,282) EnviroGard polished chrome-plated brass bubbler head provides sanitary service in the worst of conditions. The stainless steel shroud covers the orifice surface until the water is activated, and covers it again after use. Spacious fountain design allows for the trap to be internally mounted which allows for easy access, and aids and reduces the installation process. Model 6426, 12" x 2", in-line lead removal element that reduces lead from incoming water supply. Model 6700 universal mounting plate for most wall mounted fountains. Model 6800 universal in-wall mounting support for use with most fountains. Model HCR8, chiller provides for instantaneous cooling to meet a continuous demand for chilled water.